Sad news for fans of DuckTales. Scrooge McDuck, legendary billion-quintiplitilion-unptuplatillion-multuplatillion-impossibidillion-fantasticatrillioniare, has died. Scrooge born in Glasgow Scotland, immigrated to the US in the 1870's after working as a shoe shiner where he earned his legendary dime. After a failed go out west Scrooge returned to Scotland where befriended a millionaire who had struck it rich mining gold. Deciding to try his own hand, Scrooge traveled across the globe, searching for gold in Africa and Australia. In 1899 he hit it rich with a mine in the Klondike. From there he went on to found his first bank that would become a stepping stone on his quest to become the richest duck in the world. He is survived by his Nephew Donald, and his three great nephews, Huey, Dewey, and Louie. His death is a result of a failed dive into gold coins. 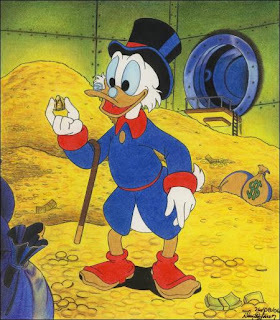 With scrooge's passing his arch rival Flintheart Glomgold officially becomes the world's richest duck. 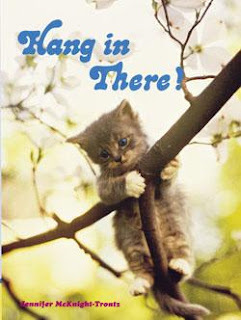 After years of managing to 'hang in there' hope was finally dashed this last Monday. Famous for a series of motivational posters, 'Baby' officially gave up hope and allowed herself to fall to the earth. Many vigils had gathered over the years to watch and be inspired by the cat, never once thinking to actually rescue it. Hope is survived by Faith, Love, Charity, and Revenge. After a few years of struggling to resurface, in such fair as 'Justice League' and 'Saw VI' the decision to pull the plug on George Newbern's career has been announced. Newbern, reminiscing about the glory days, admitted that secretly he'd always thought he'd peaked in 'Double Switch' an 80's Disney riff on the classic Prince and the Pauper story. he also expressed his sorrow by stating that, "No one should ever outlive their career." Paul Rudd, his doppelgänger could not be reached for comment. Andy Griffith continued to baffle scientists this week by living. 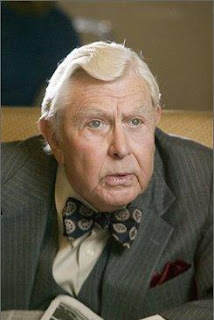 Best known for his roles as Sheriff Andy Taylor on 'The Andy Griffith Show' and Matlock on 'Matlock,' Andy Griffith has graced our TVs for decades. While it is known that he is the last civil war veteran alive, many theories abound as to whether or not Mr. Taylor is in fact General Stonewall Jackson. One thing is for certain, he sure can sing. I told my sister that one of my bosses had a sign in his office that said, "are you proud of it? could it be simpler?" ... so she made fun of me for being into such corporate crap. Naturally she got motivational posters for Christmas. LOL. That'll learn her. I still want the motivational poster from Futurama "Monday Monkey lives for the weekend"
Hilarious post!!!! Though I beg to differ about George. I have a good feeling about 2010 for him. Father of the Bride 3? Adventures in Babysitting 2? Actually I would be up for either of those. Especially Adventures in Babysitting 2. Ha ha, that is quite funny stuff. Dude I loved George Newbern in Paramedics!!!!!!! 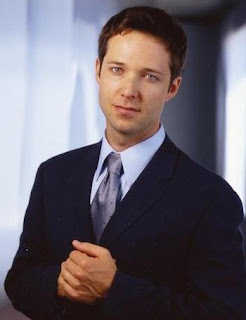 I love George Newbern, that's why I included him.